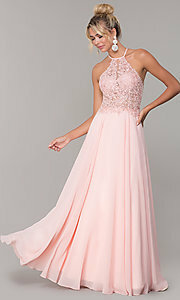 This blush pink backless prom dress is sure to turn heads. Embroidered lace applique over sheer mesh forms the beautiful illusion-sweetheart high-neck bodice as thin straps secure the bodice of the backless evening dress. Lace tendrils delicately spill onto the skirt and trim the waistline at the back. Long layers of silky soft chiffon flow from the natural waistline to a formal floor length creating a full and fabulous style. Attend a gala, a sweet-sixteen event, or prom 2019 wearing this lovely long backless prom dress in blush pink.